There are many different types of pasta makers that are available on the market. These types of machines can vary in color, size, price, function, and more. Are you looking for an electric model or manual model? In addition, your budget will also be an important consideration. The frequency of which you will be making pasta may also be a key factor in your purchase. 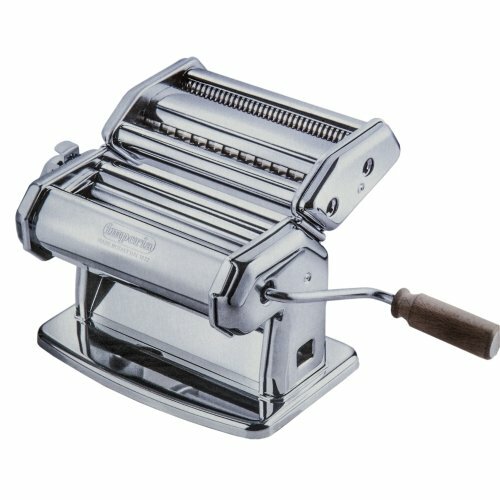 By using our comprehensive guide of the best pasta makers, you can discover the machine that is the most appropriate for your experience level, budget, preference, and other unique needs. Recognized as one of the most innovative and advanced pasta makers ever created, the Philips Pasta Maker can produce delicious noddles almost instantly. Although the product is expertly designed primarily for home use, the pasta maker can benefit those in commercial kitchen settings as the super fast speeds enable users to create pasta in an extremely timely manner. When you need pasta immediately, you can depend on the product’s speed to quickly make large batches of dough. The product’s built-in food processor also promotes speedy pasta making sessions. Simply place the ingredients into the machine, and the pasta maker will be happy to perform most of the work. Your primary responsibility is to ensure that the machine is always working properly. Since the product contains a variety of special features, the Philips Pasta Maker is the perfect addition to every pasta lover’s kitchen. As an electric pasta maker, this product is equipped with a sophisticated mechachism that mixes and kneads your dough before propelling the component through the machine with the continued use of a 200-watt motor. Because the excellent product is able to generate 1,600 pounds of extrusion force, the dough can easily glide through the machine without much manual effort from you. By simply pressing a button, the machine will be able to create about a pound of raw pasta within 15 minutes. There are very few electric machines that can produce pasta at this rate. 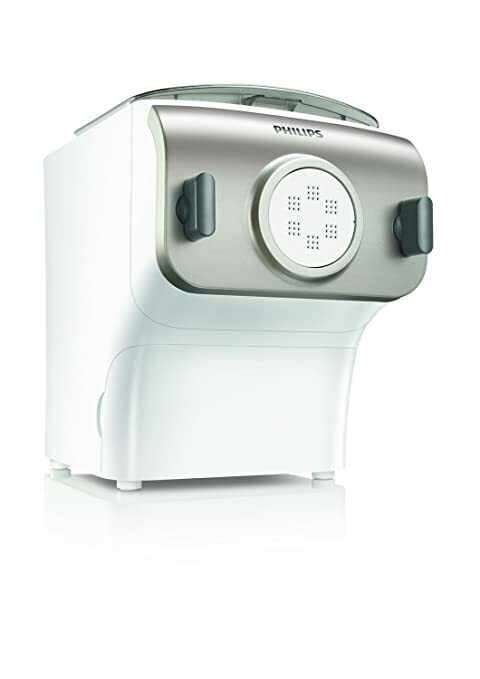 The Philips Pasta Maker is sold with attachments and alterations to create a variety of pasta including spaghetti, penne, fettuccine and lasagna. These excellent shaping disks provide you with more flexibility when creating a delectable Italian dish. You can produce additional types of pasta by purchasing more attachments. A total of eight shaping disks are available for the Philips Pasta Maker. These additional shaping disks include angel hair, pappardelle, thick spaghetti, and tagliatelle. In order to streamline the cooking process, the company offers you measuring cups for the wet and dry ingredients. Also included with every purchase is a recipe book that features a diverse collection of award-winning dishes with different favors and ingredients to incorporate into your pasta dough. The recipe book also presents numerous toppings and sauce combinations such as penne mac and cheese and four-cheese carrot pasta. These delectable dishes can be made with nutritious ingredients such as egg, carrot juice, and spinach. The recipe book features over 20 different pasta recipes and 24 various pasta flavors. If you are just learning the basics of making pasta, this recipe book will be your new best friend. Experienced Italian cooks may also benefit from this complimentary gift. One of the most treasured features of the product is the hidden drawer under the unit. This convenient drawer enables you to store key accessories such as the shaping disks between uses. You can easily clean this drawer by hand or in the dishwasher. After using the Philips Pasta Maker, you can clean the entire machine with the specialized brush that is included with your purchase. The uniqueness of this expertly designed brush lies in its ability to clean hard-to-reach and other troubled areas. 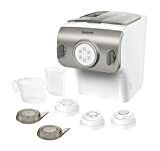 Most pasta rollers are equipped with extruders that can be difficult to clean; however, the design of the Philips Pasta Maker is unlike those of similar products. This pasta machine is produced in such a way that the parts can be easily detached and cleaned. The disks can also be cleaned by removing the remaining pasta dough with the specialized cleaning brush. Available in a premium silver shade, the product should be cleaned often to avoid unattractive smears and smudges. Weighing roughly 17.2 pounds, the compact size of the unit allows you to easily clean the product frequently. The size of the unit is 13.4 x 15.9 x 12 inches. For those who enjoy eating pasta dishes throughout the week, the Philips Pasta Maker is the perfect solution for creating simple homemade pasta and noodles for occasions such as dinner parties, birthdays, anniversaries, and Christmas. The unit offers you a wide range of pasta shapes, so the possibilities are truly endless with this sophisticated product. Most online reviewers have stated that the Philips Pasta Maker is one of the easiest pasta machines to operate. After purchasing this product, you will agree that creating pasta is as simple as simply pressing a small button. The Cucina Pro Imperia Pasta Maker Machine has been voted by many Italians as one of the best pasta maker machines on the market. Many Italians use the machine everyday, and they view the product as an essential and practical kitchen item. This traditional product is sturdy and well-built; therefore, this pasta maker machine is equipped to create delicious pasta that resemble those offered at a tasty restaurant. The item’s durability has saved many customers tons of money as they never had to purchase another pasta machine. Often referred to as the Rolls Royce of pasta machines, this product is unlike any other pasta maker on the market. The Cucina Pro Imperia Pasta Maker is sure to enhance your overall pasta making experience. Made of heavy-duty steel construction, this traditional pasta maker is the definition of beauty at its finest. Along with its sturdy and sleek base, the Italian premium manufacturing and craftsmanship is reflected in the solid steel and wooden cranking handle and the durable metal clamp. The product is also equipped with a 6-inch wide roller, so prepare yourself for the most delicious and freshest pasta that you have ever tasted. The Cucina Pro Imperia Pasta Maker Machine is extremely easy to operate. After attaching the product to a flat surface with a clamp, gently glide the pasta through the two rollers to create increasingly thin sheets. You can narrow the space between the rollers by turning the dial on the side of the machine. Depending on the position of the dial, the cutting attachment can cut the pasta into wide or narrow shapes. The product is sold with a double cutter to create spaghetti and fettuccine. Additional attachments are sold separately. The ravioli maker is one of the most popular attachments, but there are a variety of other shapes that are also coveted. Regardless of the shape that you choose, the various attachments can easily be placed firmly on the machine to create the perfect pasta consistency. Weighing less than 8 pounds, you can easily transport this product to another area in your kitchen or a friend’s house. The Cucina Pro Imperia Pasta Maker Machine can also displays nicely on your kitchen countertop. Most users enjoy the flexibility of the product as they can create fresh pasta basically anywhere. As one of the oldest companies in Italy, Imperia is staff by only qualified Italian workers who produce pasta makers using premium components. Since its establishment, this renowned company has been recognized as the leader in manufacturing high-quality kitchen products that encourage authentic Italian cooking. Throughout the years, the company has shipped products to over seventy-seven countries worldwide. When you purchase the Cucina Pro Imperia Pasta Maker Machine, you will be using the same machine as many natives who reside in Italy. This machine is sold with a recipe book so that you can surprise your dining guests with an amazing Italian experience. The product also includes a five-year guarantee that protects the pasta maker against breakage. The Cucina Pro Imperia Pasta Maker Machine can be sold gift-boxed. The product dimensions are 8.1 x 7.4 x 6.7 inches, and the item weight is 7.7 pounds. Created for expert and beginner pasta makers alike, the Marcato Atlas Wellness 150 Pasta Mamake can be a wholesome component of the cooking process. The ultimate goal of the product is to encourage healthy eating among its users. Enjoying fresh pasta is just moments away when you purchase the Marcato Wellness 150 Pasta Maker. While other pasta makers may claim to have wellness features, the Marcato Atlas Wellness 150 Pasta Maker is one of the only products that contains components that support this philosophy. In order to reduce the risk of consuming harmful substances, this pasta maker is equipped with flat rollers and double cutters that are not manufactured with heavy metals such as nickel and chromium. Instead, the rollers and cutters are made of durable anodized aluminum, which is a wellness innovation that promote healthy pasta making results. The flat rollers and double cutters also feature a special micro-rough surface that can firmly grasp the dough. In addition, the rollers on this innovative product are resistant to corrosion while the robust gears offer an extra-long life. Since the handgrips on the pasta machine are made of ABS plastic, they are also suitable for food preparation. As a result, you will not ever have to worry about fragments of plastic slipping in your dough. Another impressive feature of the Marcato Atlas Wellness 150 Pasta Maker is the ability to create pasta dough with your desired thickness. You can easily adjust the thickness of the pasta dough by using the adjustable dial that contains nine settings. The thickness of the pasta dough can range between 0.3 millimeters and 2.5 millimeters. The wide range of dough thickness options can enable you to create pasta like spaghetti, tagliolini, and more. Most customers enjoy the simplicity that is associated with the Marcato Atlas Wellness 150 Pasta Maker. The product is known for creating scrumptious pasta without any residue, mess, or hassle. The pasta maker is so easy to use that you may feel like an Italian chef while you are preparing home-made meals for your dining guests. After regular use, you are sure to recommend this sophisticated pasta maker to your family, friends, coworkers, and strangers. You might even purchase the product as a gift for a special loved one. Along with the pasta maker, the box also includes a durable clamp, comprehensive instruction manual, and recipe book. The attachable blades for creating spaghetti, linguini, and ravioli are available as a separate purchase. The Marcato Atlas Wellness 150 Pasta Maker is sold complete with a three-year warranty. The size of the product is 8 x 8 x 7 inches and the weight is only 3 pounds. This exceptional pasta maker is currently offered in the following colors: stainless steel, black, red, green, pink, gold, copper, brown, and light blue. The Meglio Pro Pasta Maker is the perfect product for those who are searching for a budget friendly pasta maker machine. The product may be suitable for novice pasta makers as opposed to experienced Italian chefs. The relatively inexpensive price tag will enable you to explore pasta making without spending a ton of money. If you would like an affordable pasta maker that performs exceptionally well, consider buying the Meglio Pro Pasta Maker. 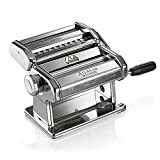 Made of heavy-duty stainless steel construction, this product can create popular pastas such as spaghetti, fettuccine, lasagna, and ravioli by rolling and slicing the dough. Since the rollers can adjust for thickness, you can make any type of pasta that you choose. Before making your favorite type of pasta, fasten the machine securely to tables or workstations with the clamps. Weighing only 5 pounds and measuring 8 x 6 x 8 inches, the Meglio Pro Pasta Maker can be used in a variety of settings. Because the product is equipped with non-slip feet, the pasta maker is unlikely to tumble during outdoor or indoor use. This essential kitchen tool can be used on most flat surfaces such as workstations, tables, and countertops. Many online reviewers who have tried the Meglio Pro Pasta Maker have stated that the product is grear for beginner pasta makers. Most of the customers loved that the machine can produce perfect strands of pasta with minimum effort from the user. If you throughly read the instructions before using the pasta maker, you should not encounter many problems when operating the machine. Some customers were also amazed by the quality components since the machine is extremely affordable. As a result, you can expect to receive a durable product even though the pasta maker has a low price tag. Join the thousands of happy customers by purchasing this budget-friendly product today. The majority of pasta makers that are available today are known as hand-crank models. These manual pasta makers can be secured to your kitchen countertop with a durable clamp. By turning the crank arm on the side of the machine, you can propel the dough through the rollers. The crank arm should fit snugly into the machine. Additionally, the crank arm should be relatively easy to turn. Most machines enable you to adjust the distance between the rollers by using an adjustable knob. Manual pasta makers may be easier to operate with two people. As one person glides the dough through the rollers, the other person can turn the arm. An alternative to hand-crank models are electric pasta makers. These types of pasta makers function much like their manually operated counterparts, but they are powered by electric motors. The electric motors are programmed to move the rollers and flatten the dough. Unlike hand-crank models, electric pasta makers do not need to be stabilized by a clamp to operate properly. A electric pasta maker will present you with the opportunity to create many new dishes that your family and friends will definitely enjoy. The products are especially useful if you will be regularly making large amounts of pasta for big crowds. Most long-lasting pasta makers are composed of extremely materials such as stainless steel or chrome-plated steel. Since chrome-plated pasta makers are prone to rusting, they typically require more maintenance than stainless steel pasta makers. Stainless steel pasta makers are resistant to rust. Any pasta maker that is composed of all-metal components is more durable than pasta makers made of plastic. Some of the most interesting pasta makers are painted in fun and vibrant colors. These types of machines may be ideal if you regularly host parties or run a extraordinary commercial kitchen. With a variety of colors and materials, there is truly a pasta maker machine for everyone. Many models are sold with a few attachments. These attachments allow you to create different variations of pasta. If you have a pasta preference, you may want to consider buying a pasta makers that contains the desired attachments. You can always buy attachments separately if you fall in love with a pasta maker that does not contain the necessary shaping disks to create your favorite dish. Some pasta makers are often sold with many complimentary accessories like a bonus attachment, receipe book, cleaning brush, or other free gifts. A pastry wheel is a popular accessory that can be use to enhance the overall appearance of the pasta. A ravioli press may also be included in the box. This accessory is designed to shape the dough into the shape of a ravioli. When you are shopping for a pasta maker, consider purchasing one that includes additional items in the box. You may save money in the long run if you not have to buy accessories that are typically sold separately. The higher-end models are usually produced by well-established companies that are located in Italy. The price of these luxury machines can range from $50 to $1000 dollars. Although machines that originate from Italy are expensive, you can expect to receive a good value for your money. In some cases, certain budget-friendly pasta makers are considered great machines. These types of pasta makers are typically used by beginners. 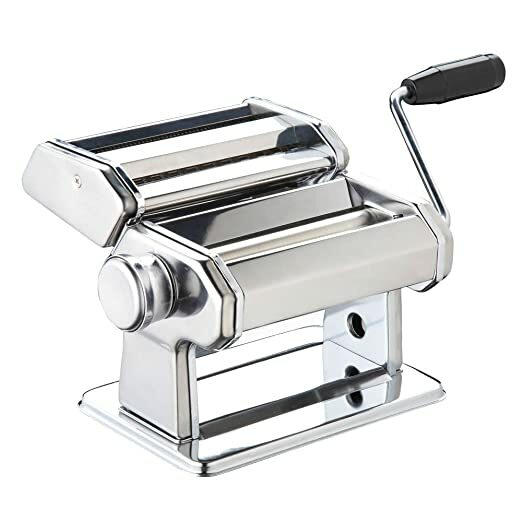 In order to properly create excellent homemade pasta, you will need to add a premium pasta maker to your collection of essential kitchen equipment. Because there are so many pasta makers available at retail stores and online, it’s a good idea to thoroughly understand the components of a high-quality pasta maker. Now, you can select the most appropriate machine for your unique needs. Remember your preferences and price range. You can refer to this list to retrieve any additional important considerations.